Affinity Supporting People Limited are our official Charity Principal Partner. After agreeing an initial one-year sponsorship in April 2019, Affinity Supporting People Limited will be recognised as the Principal Partner of the Charity that delivers 30 projects to over 17,000 local people. Affinity Supporting People is part of National Care Group (NCG) with headquarters at the Globe Centre in Accrington. NCG are an award-winning provider of care and support services to vulnerable adults throughout the United Kingdom. Specialising in supporting young individuals and adults with a wide range of disabilities and needs, they are proud to offer the following services: supported living, residential care, outreach & home support, and day services. Photo: Martin Fearon – CEO at ASCT, Daniel Clark, Dominic Dyer – Business Development Consultant at Affinity. Photo: Daniel Clark, Leah Whelan – Registered Manager at Affinity, Dominic Dyer – Business Development Consultant at Affinity. 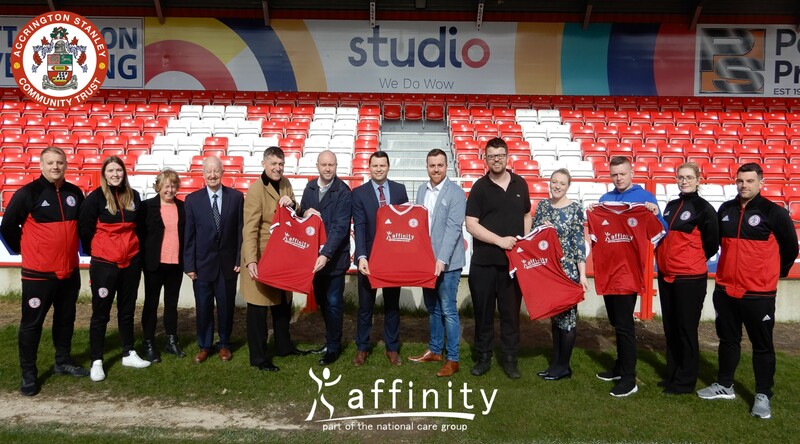 ‘’We are delighted to be working with Affinity Supporting People Limited as they become the Principal Partner of Accrington Stanley Community Trust. We felt it was the right time to link up with another like-minded organisation that has the same values as our Charity, providing opportunities for our local community and making a positive difference to some of the most disadvantaged people within our borough. Photo: Martin Fearon – CEO at ASCT, Anne Ellwood – Trustee at ASCT, David Keeley – Chair of Trustees at ASCT, Leah Whelan – Registered Manager at Affinity. The partnership will also see staff at Accrington Stanley Community Trust wearing uniform branded with the Affinity Supporting People Limited logo whilst delivering projects in the community.